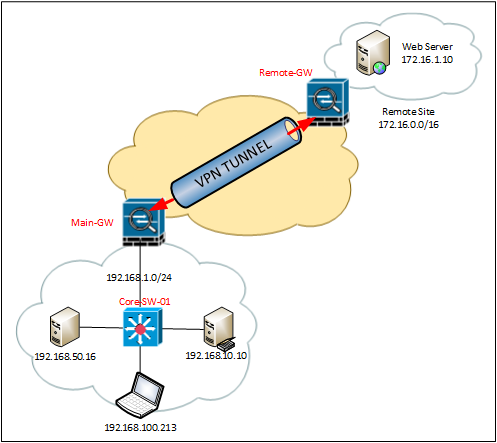 Reverse Route injection is the process that can be used on a Cisco ASA to take a route for an established VPN, and populate/inject that route into the routing table of other devices in it’s routing group. In the example below, on the main site, we have a Layer 3 switch that’s routing all the 192.168.x.x networks, and we have an established site to site VPN to a remote site. To access the web server at 172.16.1.10 the 192.168.x.x networks need a route to it. 1. We already have a site to site VPN, let’s find out what cryptomap it is using. 2. So in this example it’s called CRYPTO-MAP 1, let’s enable reverse route injection for that crypto map. 3. Now create a ‘prefix-list‘ that contains our remote VPN subnet. (Note: if you had a lot of remote subnets you could add them separately or simply summarise them if they were contiguous networks). 4. Now create a ‘route-map‘ that uses our prefix-list. 5. To be honest you would already have OSPF setup at this point but, for completeness, let’s run through the OSPF setup. 6. And while still in config-router mode, set it to redistribute our VPN network(s). And finally remember the ASA wont send out any networks, without a default-information originate command. 8. To make sure it has worked, on the core switch CORE-SW-01, look at the routing table.